The Baltimore Ravens jumped out to a super early 14-0 lead on the Derek Carr-less Oakland Raiders, and seemingly never looked back en route to a 30-17 victory. TE Vince Mayle actually carried in a two-yard touchdown on the Ravens first possession while CB Jimmy Smith pushed the lead to 14 with a scoop and score, 47-yard fumble recovery just 3:50 into the game. Javorius Allen punched in a one-yard score and Justin Tucker knocked home three field goals for Baltimore who held the Raiders to just 245 total yards on offense. Without their star quarterback, Oakland turned to veteran QB EJ Manuel who completed 50 percent of his passes and had a touchdown to WR Michael Crabtree, but only totaled 159 yards through the air. RB Marshawn Lynch scored from three yards out to push the Raiders to within one possession in the third quarter, but neither offense would score a touchdown following Lynch’s touchdown run. With that, we give you our PFF exclusive takeaways from the contest for each team. Veteran WR Mike Wallace showed he still has jets as he ran right by Raiders CB Sean Smith on two occasions, catching two deep balls for 106 yards against him. 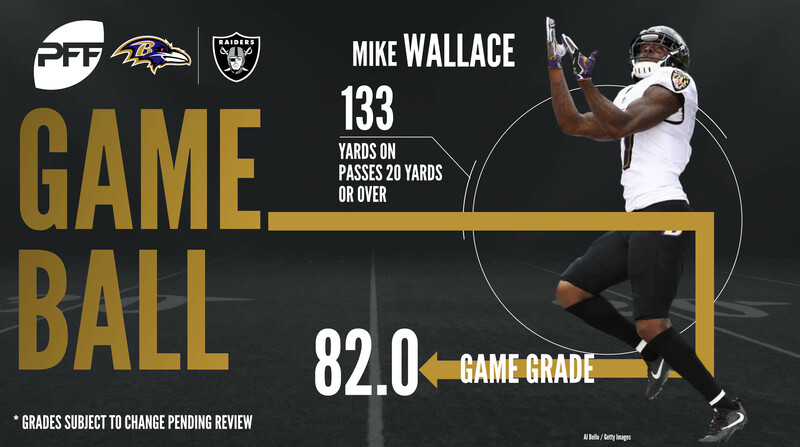 Wallace caught all three of his targets for 133 yards and QB Joe Flacco had a passer rating of 118.8 while targeting him. Ravens fans will hope to see more deep targets to Wallace in the coming weeks as it adds a dimension to the offense which has been lacking in previous weeks. Flacco will have to tip his hat to his offfensive line as they provided him with plenty of protection against one of the top defensive fronts in the league. He was only under pressure on four of his 26 drop backs and was very accurate when given time, completing 72 percent of his throws for 204 yards with a clean pocket. Three of the four Ravens linemen had pass block grades above 80.0 with Austin Howard leading the way at 80.8. Judon played one of the best games of his short career so far against the Raiders. Although he wasn’t great rushing the passer, with only one hurry, he was great in run defense and in coverage. In coverage, he was targeted twice, allowing no receptions and coming up with a pass defense. In run defense, he came up with two stops and a run defense grade of 83.8. Henry was an integral part of clogging up the middle for the Ravens defense on Sunday. Henry made four stops in run defense and had a run defense grade of 78.6. Henry also showed good awareness by knocking down two passes at the line of scrimmage and finished the game as the Ravens second-highest graded defender. Donald Penn was the best member on the Raiders outstanding offensive line against the Ravens. Although he did allow a sack to Terrell Suggs, which was the only pressure that he allowed on the day in 31 snaps of pass protection, good for an 80.5 pass protection grade. Penn was also great in run blocking with an 85.3 run blocking grade. Playing only 27 snaps, 13 of which were rushing attempts, Lynch had the best game of his season against the Ravens. He wasn’t given a ton of running room in front of him by the Raiders offensive line, but he made the most out of it, with 28 of his 44 yards coming after contact. Lynch forced two missed tackles on the day and barreled his way into the end zone for a the Raiders lone score. Second-year safety Karl Joseph was a force in the box for Oakland, as evidenced by his run defense grade of 90.9, which led the team. He recorded five defensive stops and his run stop percentage of 11.4 puts him just behind Lions safety Glover Quin for second in Week 5. Joseph wasn’t targeted much in the passing game; the only completion he allowed he recorded a tackle for loss. Mack was held largely in check in terms of pass-rushing as he didn’t record a pressure on the day in large part to Ravens QB Joe Flacco getting the ball out quickly. Flacco’s average of 2.3 seconds per attempt left little time for Mack to utilize his pass-rushing skills and certainly aided the Ravens offensive tackles throughout the game. Even though Mack was kept quiet in terms of rushing the passer, superstar athletes like him will show up in some way as his run defense grade of 87.1 was second on the team to go along with his team-high six defensive stops.